The New Forest coast alongside Southampton Water and the Solent is a wonderful place to visit with much to offer walkers, wildlife enthusiasts and those who simply want to enjoy fresh air and sea breezes. But it's easy to overlook the history and heritage associated with this coast, evidence of which often remains visible but is largely unappreciated. Yet, from soldiers to seaplanes, smugglers to salt-men, and sailors to shipwrecks, the New Forest coast has many fascinating tales to tell of yesteryear. Here, then, is a brief introduction to many of the more significant aspects of this region's rich history. (Skip down the page for links to more detailed information about selected topics). Calshot Castle dates back to the days of Henry VIII in the 16th century and was constructed as an artillery castle to guard the approaches to Southampton. 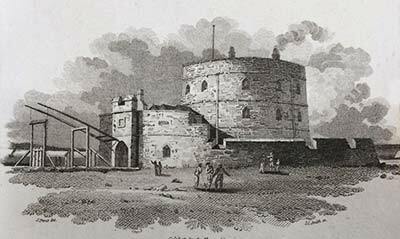 A prominent central gun-tower, or keep, is surrounded by a low, continuous, circular curtain wall separated from the keep by a courtyard. There is also a gatehouse and a shallow stone-lined moat crossed by a bridge that originally could be raised. A little to the west, at the tip of Hurst Spit, is historic Hurst Castle, another structure that in part dates back to the days of Henry VIII, although subsequent alterations and additions reflect England's changing defensive needs right the way up to the Second World War. 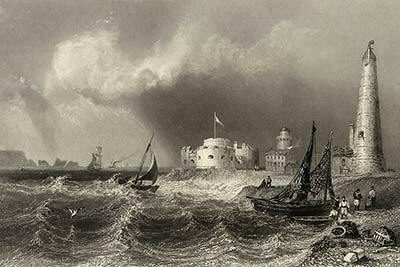 A view of Hurst Castle in 1840 showing two lighthouses. The lower, known as the Low Light, dated from 1784-86 and was the first to be built at Hurst. The taller, conical-shaped lighthouse - the High Light - dated from 1812. Both were eventually replaced. In addition to its castle, Hurst Spit was also the site of numerous lighthouses, the first dating back to 1786, and a busy settlement which contained a Preventive Station - the base of those charged with thwarting smuggling; a herring drying house; at various times, three inns; a number of cottages; stables and storehouses. Yet it was not only at Hurst that smugglers operated - the area around the Spit was considered to be notorious as a favourite resort of smugglers from the Isle of Wight - for in the 18th and early 19th centuries smuggling was rife elsewhere along this coast, so-much-so that for much of the 18th century the revenue cutter Calshot plied local waters and found sheltered anchorage alongside Calshot Spit where it would lie in wait before giving chase to suspected miscreants. Right the way along this coastline can be found evidence of centuries old salterns - ditches and banks, creeks and aged buildings - reflecting a long history of exploitation by men who made their living by extracting salt from seawater; whilst Hawker's Cottage in Keyhaven village, close to the Gun Inn, recalls the exploits of the 19th century serial wildfowler Colonel Peter Hawker. Salt making was not confined to the 17th, 18th and 19th century - the times often regarded as the industry's heyday - for archaeological investigations at Manor Farm, Pennington - reported in the 2009 Proceedings of the Hampshire Field Club - revealed an Iron Age settlement with at least ten roundhouses, and evidence to suggest that salt making was undertaken by the inhabitants. 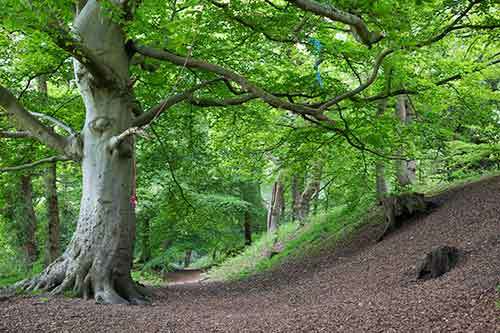 Of similar vintage, Buckland Rings is a mere 4.5 kilometres to the north. An important Iron Age hill fort dating back 2,000 years, and more, Buckland Rings stands beside the often busy A337, although it can not be properly appreciated from the road but can be accessed on foot using a number of paths. One is left to wonder about the relationship between the Pennington settlement salt-men and the hill fort inhabitants, for surely they knew each other well. Near to Buckland Rings - 500 metres, or so, away - also lies the once defended Iron Age settlement of Ampress, whilst a further fortified settlement is on a promontory at Lower Exbury. Eling tide mill sits on the seaward side of a causeway spanning Eling Creek, where Bartley Water reaches Southampton Water. 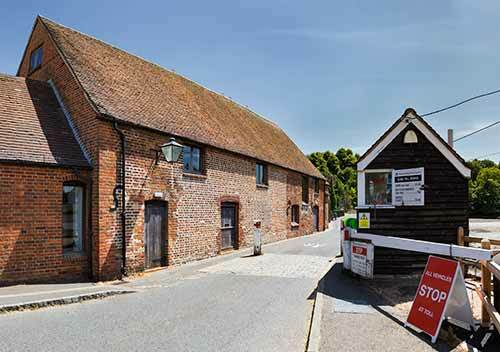 The Domesday survey of 1086 refers to two local corn mills, one or both of which might have been tide mills on the present site, although the current building is thought to have been constructed in 1785. Nearby, the parish church of St. Mary the Virgin is of Saxon and Norman origin, but the church, as with many others, was subject to substantial restoration in the second half of the 19th century. 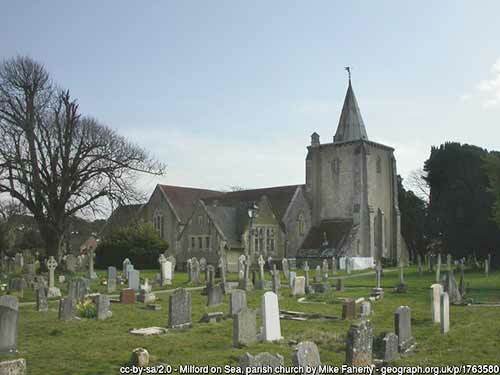 Beautiful, historic churches can be found at Dibden, Fawley and Milford on Sea. All are dedicated to All Saints. Sadly, the parish church at Dibden suffered bomb damage in 1940, but thankfully was restored and re-opened in 1955. The late 13th century 'lofty and well-proportioned' chancel remains, the nave was re-built in the 20th century and the tower dates back to 1884. Nikolaus Pevsner, however, rather uncharitably, describes the new work as 'gothic and unexceptional'. The church at Fawley was first recorded in 971AD, whilst construction of the present church was begun in 1170. It has been described as 'a splendid Norman building, with additions until around 1300'. Pevsner introduces it thus: 'A good village church, long, low, and rectangular, with three gables and a strong, fairly tall and happily proportioned tower placed unusually in the middle of the south side between aisle and chancel chapel'. At Milford on Sea, All Saints is, again according to Pevsner: 'almost completely Early English, of the later 13th century, in its style derived from the work of the same moment at Christchurch'. It has also been described as: '.... a very fine and interesting building, wonderfully spacious and dignified considering its comparatively small size, chiefly built of Binstead stone from the Isle of Wight, which as usual has stood well, so that the original details are for the most part in excellent preservation'. 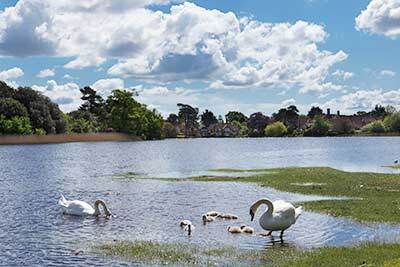 Whilst few people would suggest that Beaulieu is a coastal village, the Beaulieu River there is estuary-like and tidal, and the Solent Way, a long distance footpath that runs from Milford on Sea to Emsworth Harbour, passes through. Well known to visitors as the home of Palace House and the National Motor Museum, Beaulieu was originally the site of an early 13th century Cistercian Monastery that was dissolved in the 16th century by Henry VIII. Reminders of the monastery include the foundations of the abbey church, the remains of the cloisters and Beaulieu parish church, which once was the monks' refectory. The Outer Gatehouse, a structure dating back to the 14th century, can also still be seen beside the road a little to the north of Beaulieu Mill, a now disused tide mill located on Beaulieu Bridge. The three-storey mill structure is a mixture of ages, reflecting centuries of repair, rebuilding and modification. Although standing upon medieval foundations, the mill has much surviving 17th century fabric and a largely 18th century mechanical layout that was last brought up to-date at the end of the 19th century. Corn continued to be ground there until the early years of the 20th century, after which the mill was used to produce animal feeds until around 1942. 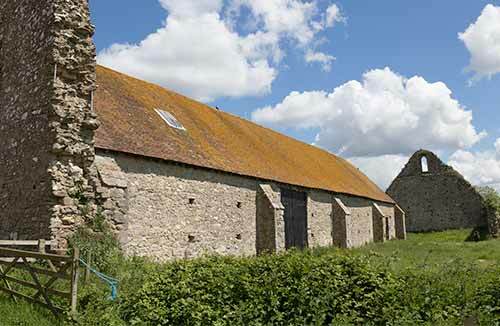 A little to the south-east of Beaulieu, also on the Solent Way, is St Leonard's Grange and an adjacent ruined chapel and tithe barn, all on private land but clearly visible from the road. Originally a grange of Beaulieu Abbey, the present house is said to date mainly from around 1700, whilst the chapel is from the early 14th century. The enormous 13th or 14th century tithe barn is thought to be one of the largest in England at 64 metres (210 feet) long and 21 metres (70 feet) wide, and with a capacity of ½ million cubic feet. Buckler's Hard lies on the Beaulieu River, downstream of Beaulieu village. Originally intended to be a port when first created by the second Duke of Montagu, it became from the mid-18th century a shipbuilding centre that produced many warships, including some used by Admiral Lord Nelson's navy during the Napoleonic Wars. A late 18th century, incongruously wide street running down to the river has contemporary cottages either side. Bailey's Hard, a little upstream from Buckler's Hard, was also known as a shipbuilding centre. Indeed, the first vessel to be built on the Beaulieu River - the 48 gun Salisbury in 1698 - is thought to have been constructed there. Near to Bailey's Hard, a tall red brick chimney, clearly visible from the adjacent Solent Way, is that of the old Beaulieu Estate brickworks, an enterprise dating back to 1790. Situated around 6 kilometres (4 miles) from Beaulieu, and also on the Solent Way, Sowley Pond owes its existence to Beaulieu Abbey monks who dammed two small streams to create a fish-pond. Nowadays a haven for wildlife, the peace and quiet is broken only by occasional cars on the adjacent minor road, but it was not always so, for an ironworks operated nearby from the early 17th to the early 19th centuries, using water from the pond to power blast furnace bellows. The New Forest, its coastline and hinterland made significant contributions to the war effort in both the First and Second World Wars. Here are some examples from the coast and adjacent coastal strip. In 1913, Calshot Castle became part of one of the first Royal Navy Air Stations with, located on Calshot Spit, wooden sheds large enough to house twelve seaplanes. Later, during the First World War, in the early days of aviation, Calshot-based seaplanes undertook anti-submarine patrols in the Channel. Not far away, inland at East Boldre, in 1915 the Royal Flying Corps took over the one-time home of the New Forest School of Aviation for use as a training school for First World War pilots. Flying at that time was a hazardous business using often unproven, flimsy aircraft. Furthermore, engines were not wholly reliable and navigation aids were limited. Accidents were commonplace and it has been said that on average, a combat pilot had a life expectancy of no more than a few weeks! 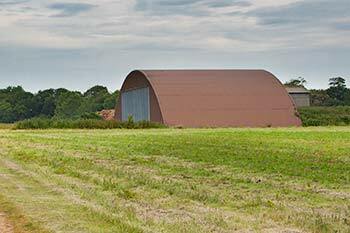 And then during World War Two, a large new airfield was constructed just across the Beaulieu - Lymington road, whilst not far from the modern day Lymington Ferry Terminal, was Lymington Airfield (or Pylewell Airfield, as it was also known). A temporary, two runway airfield overlooking the Solent, it was similar in design and purpose to another at Needs Ore Point that housed over 100 Hawker Typhoons. Known as Advanced Landing Grounds, the Lymington and Needs Ore Point airfields were used as bases for aircraft to support troops engaged in the D-Day landings. Scattered wartime brickwork and concrete bases remain at the Beaulieu airfields and along a stretch of private beach at Needs Ore.
As has already been noted, Calshot Castle and Hurst Castle were constructed to help safeguard the country from seaborne invasion, but it was another armada that gathered off-shore along here in 1944, a flotilla of landing craft ready to sail to France as part of the World War Two, D-Day taskforce undertaking the Allied invasion of Normandy. Code named Operation Overlord, this is considered by many to be one of the most remarkable feats in military history - it was certainly the largest seaborne invasion in history. Little evidence of this remarkable undertaking is now visible along this coast, although at Lepe, in the Country Park, the remains of wartime slipways can still be seen and so can concrete roads, building bases, parts of the pier-head used to load departing ships and other reminders of war. Whilst walking along the seawall or shoreline elsewhere, though, it does not take much of a leap of the imagination to visualise the scenes. In common with large country houses elsewhere, Pylewell House, near Lymington, was requisitioned for World War Two military use and so, on the shores of the Beaulieu estuary, was Exbury House, and nearby Inchmery House where Free French and Polish commandos trained for intelligence operations. 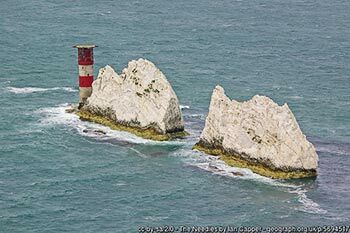 Many reminders of the past lie below the waves, out of sight of all but those prepared to dive underwater, for the Solent, particularly in the area around the Needles, has become the last resting places of ships, aircraft and the many brave souls who sailed and flew in them. A 2010 report produced by Wessex Archaeology and commissioned by the New Forest National Park Authority, notes with certainty the presence of 114 shipwrecks of which the oldest, located a little to the north of Yarmouth, Isle of Wight, dates back to the 16th century and is believed to be that of a merchant ship of Mediterranean build, possibly the Santa Lucia, a cargo vessel lost in 1567. Others wrecks of note include that of HMS Assurance, a British 5th rate warship that struck the west Needles in 1753 whilst seeking shelter; of Pommone, a 38 gun warship built in 1805 that was lost whilst attempting to navigate the Needles Passage on the night of 14th October 1811; and of the Campen, a Dutch East India Company ship wrecked in 1627. Aircraft crash sites include those associated with a Junkers German bomber lost off Egypt point, Isle of Wight, in 1945; a Junkers Ju88 and Heinkel He111 that crashed in the Western Solent; a Bristol Beaufighter that crashed after losing a propeller during a patrol; a Bristol Hydroplane that suffered engine failure and loss of power; and a Messerschmitt BF110D that was shot down to the west of the Isle of Wight by RAF fighters. Yes, the rich heritage of the New Forest coast and surrounding area certainly gives cause for thought as we in the 21st century enjoy our visits, whether for sailing, walking, fishing, bird-watching or simply to enjoy the fresh air, fine views, bracing breezes and wonderful atmosphere.